Today was a whirlwind tour of Boston and from the time I woke I’ve had the theme song from the television series Cheers in my head. I can’t say that the tour was a pleasant experience. My expectations were not met; in fact I got less than that. The lesson learnt here for me is that when you are unsure on whether to do something, it is probably best not to do it until you are certain. Only three and a half hours (out of the 13 hour tour) was spent in Boston when I thought it would be five hours at least. The remaining time was spent getting there and back with two stops in roadside stops for refreshment breaks, which wasn’t really needed except for short stretching of legs. After walking part of the Freedom Trail, our tour guide said we had a two-hour break for lunch and free time for exploring. The two hours was from 1.35pm and we had to be back by 2.45pm. I’m not the greatest with figures but that’s a short two hours. 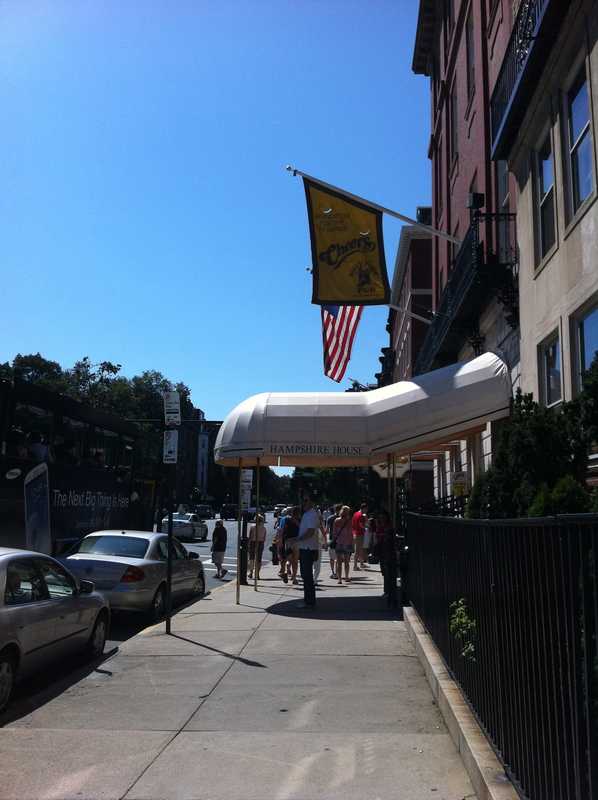 One of the spots I wanted to see was the pub that was the inspiration for the television series Cheers. I was told before I booked that stopping here was in the itinerary, however someone forgot to tell the tour guide. We did go past this spot but the bus went to fast past as he said, “on your right, if you’re quick…”, so I spent my lunch and free time getting a map and sprinting there and back before the allotted time was over. I didn’t want to be late, as the tour guide had already gone off without a number of the group a short time earlier. Now as this blog is meant to be about things that have inspired me for the day, why have I told you the above? Well because it is what has been my day and it wasn’t a disaster only disappointing. The best part of my day was going to Cheers. I am really glad that I made the effort to go to the original Cheers even if it was extremely brief. I only had a few minutes so took a few photos outside, went into the bar and asked the doorman if I could take a photo, to which he said of course. As I turned my iPhone to the bar, all the people inside raised their glasses and smiled at me. It was bright and cheerful for sure, everyone was happy. You know, I nearly risked missing the bus home just to join them for a nice cold beer. I certainly could have done with it. And I’m sure they all knew my name.